Fear of flying may be a distinct phobia in itself, or it may be an indirect manifestation of one or more other phobias, such as claustrophobia (a fear of enclosed spaces) or acrophobia (a fear of heights). It may have other causes as well. It is a symptom rather than a cause and different reasons may bring it about in different individuals. Fear of flying receives more attention than most other phobias because air travel is often difficult for people to avoid—especially in professional contexts—and because the fear is widespread, affecting a significant minority of the population. 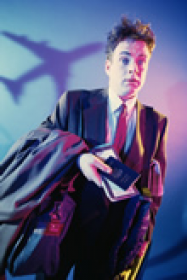 A fear of flying may prevent a person from going on vacations or visiting family and friends, and it can cripple the career of a businessperson by preventing him or her from traveling on work-related business. I have found many reasons for someone having a fear of flying. I also had a fear of flying and learned to fly as a way round it. I took my private pilots license in the 70’s before I was a hypnotherapist. I later used hypnosis as I still had the fear if I wasn’t flying myself. I only needed suggestion hypnotherapy to completely remove the fear. To understand the difference between a fear that is ‘caught’ from someone or one that is trauma based I have chosen an extract from my book Self Hypnosis to help clarify what I mean. It is an explanation of two sisters that came to me at different times. One would have been able to have the fear removed with suggestion hypnotherapy. The other would have needed age regression. Since there is no way of knowing which is required until you are actually doing the therapy I always use age regression. If you don’t uncover anything trauma-related that’s fine. If you only do suggestion therapy, there is a chance that you’ll miss something vital. This is where using a regression specialist is infinitely better than someone just using suggestion. However, you may choose to buy the book Free Yourself From Fear or a CD to check if the fear or phobia can be cleared using self hypnosis.